Texas House Speaker Joe Straus Wednesday named his five-member team to craft a final budget for the next two years, and House members urged the team not to focus on tax cuts — a contentious issue between the House and Senate. 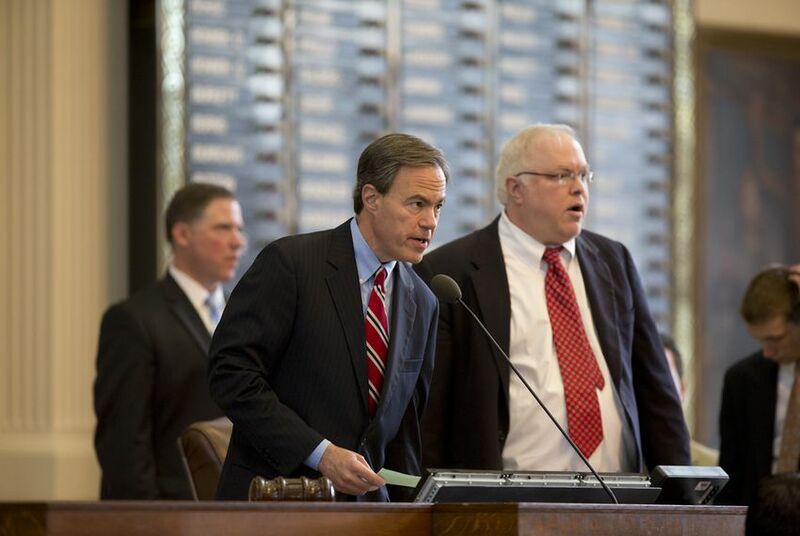 Texas House Speaker Joe Straus Wednesday announced his five-member team to negotiate a final two-year state budget with their Senate counterparts, and House members urged them not to focus on tax cuts — a contentious issue between the two chambers. The House passed a $209.8 billion budget earlier this month after an 18-hour marathon debate, and the Senate later passed its own $211.4 billion version of the budget. Each chamber now sends five members to hash out differences in the two versions. The House lineup: Appropriations Chairman John Otto, R-Dayton, and state Reps. Sylvester Turner, D-Houston; Sarah Davis, R-West University Place; Trent Ashby, R-Lufkin; and Larry Gonzales, R-Round Rock. Otto and Turner served on the budget conference committee in 2013. Lt. Gov. Dan Patrick has yet to appoint the Senate team. House members issued several nonbinding "instructions" to the budget negotiators, including a request to not address tax cuts during the negotiations. House and Senate leaders have squabbled recently over the merits of sales and property taxes, with Gov. Greg Abbott hesitant to take sides. Otto told members Wednesday that budget negotiations weren't the right place for that battle. Another instruction approved by the House urged the conferees to maintain provisions from the House budget that block funding for stem cell research and sexual education providers that also provide abortions, namely Planned Parenthood. Correction: An original version of this article misspelled state Rep. Larry Gonzales' last name.